Another tidbit about an Oregon nurse: the ER nurse who killed the intruder with her bare hands in Portland? Turns out the intruder was a hit man hired by her estranged husband, who had given him a house key and the alarm code. Thank goodness for her quick wits! hello! that last picture made me drool. no way are male RNs sissys, they are some of the best help around if you ask me. 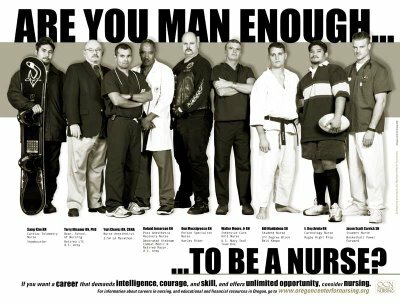 I love that ad campaign, and I own the Male Nurse action figure (a gift from a friend)! I have encountered male nurses myself and one that brings a big memory to my mind is when I was had my carpal tunnel surgery. I was in the hospital for "other reasons." I knew I had carpal tunnel syndrome when I was "admitted. "The nurses in the "unit" noticed I was dropping thing and even had trouble buttoning shirts and pants, trouble writing and dropping things. The psychiatrist decided it would be best if I were referred to an orthopedic surgeon(ironically the same one that dxd me with carpal tunnel syndrome)It was best decided since I qualified for medicaid while I was inpatient to have the surgery done. I had a case that severe that it was beyond any type of other treatment. I have a allergy to latex and basically wasn't believed and ignored until I started going into anaphylactic shock. A male nurse noticed I started developing a rash and started having shortness of breath. I informed him I was allergic to latex gloves. He was a life saver. He was so kind to me. He applogized and said he never knew I was allergic. He went the extra mile and told everyone that I was alleric to latex gloves. (It must be hereditary because my mother is too.) The nurse made sure that everything latex was not being used on me. All that surgery I had and not one hot male nurse...it almost made it not worth it at all! Nursing started out as a men only profession in the middle ages. It was monks that manned the early hospitals. And don't forget the Knights Hospitallers. I am male, a nurse, and proud of it. I've been a "male nurse" for ten years but often like to simply be referred to as "a nurse". 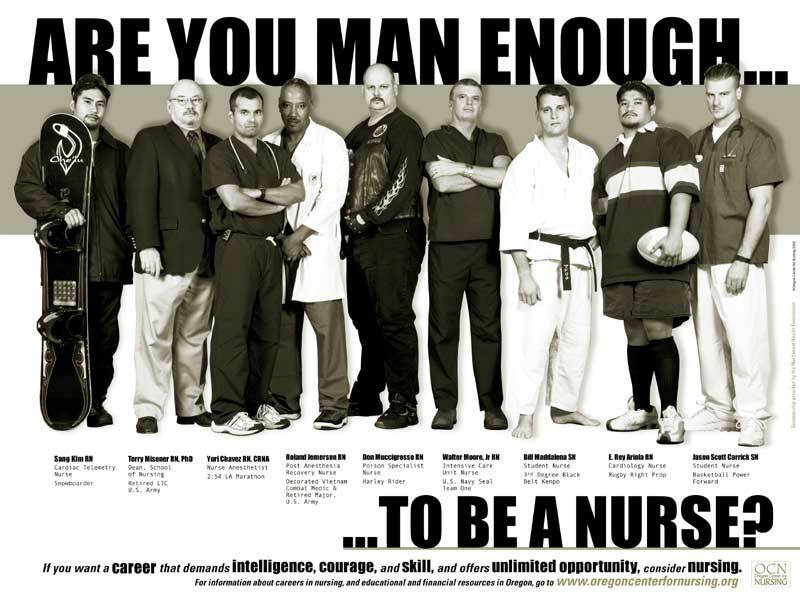 Little kids still say, "But men can't be nurses!" A popular gender-bender, as female docs still are in some circles, though much less these days. 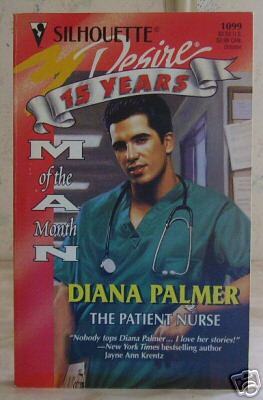 I too have the Male Nurse Action Figure received as a gift from my wife. I don't use a clipboard, though, and have never accepted a job where I would have to wear scrubs. In fact, I've never had a job tat required a uniform, just "business casual".